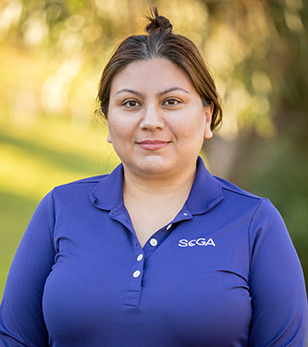 Since joining the SCGA in 2007, Bianca has provided critical support to all elements of the tournament program, including the registration process, event preparation, Team Play, all the while providing exemplary customer service to our members. In Bianca’s new role as Coordinator, she will continue fulfilling those duties, while additionally serving as the department’s operational leader of its largest program, Team Play. She is also responsible for all the inventory and supply needs of the department. Bianca also manages awards, tee gifts and the club recognition program for all SCGA tournaments. “The SCGA is a very positive environment. I’ve learned that many people in the golf industry have easy-going personalities, making my job a great daily experience." "My favorite SCGA Tournament experience has always been attending the SCGA Amateur Championship each year. Watching some of our best amateur players compete is a great privilege for me. It's also great watching all the SCGA staff's hard work pay off!" Contact Bianca Avina at: bavina@scga.org.